Padma Bhushan Award For MS Dhoni ? BCCI nominates World Cup-winning captain Mahendra Singh Dhoni for India’s third-highest civilian award. Padma Bhushan Award For MS Dhoni. An official, close to the BCCI, told PTI that Dhoni was the solitary name the Board had recommended for the Padma awards this year. Padma Bhushan Award for MS Dhoni was suggested by the officials. Mahendra Singh Dhoni has been nominated by the BCCI for the Padma Bhushan award. There was no doubt among the members that Dhoni has impeccable credentials. Two World titles (2011 50-over World Cup and 2007 World T20), nearly 10,000 runs, 90 Test matches. There is no one better than him, who could have been nominated. The officials were very clear about their nomination. The Padma Awards are part of the Indian honours system and are handed out to outstanding performers in the country for their services to the nation. The Padma Bhushan ranks third, just below the Padma Vibhushan and the Bharat Ratna, India’s highest civilian award. In the Padma Awards ceremony held earlier this year to honour the winners of 2016, Dhoni’s successor, Virat Kohli had been given the Padma Shri award. Dhoni had received the honour in 2009. Apart from the 50-overs World Cup in 2011, Dhoni led India to the inaugural World T20 title win in 2007 and the 2013 Champions Trophy title. In the past, Dhoni has been awarded the Arjuna Award, the Rajiv Gandhi Khel Ratna Award and the Padma Shri Award. Other cricketers who have been conferred with the title include Rahul Dravid, Kapil Dev and Sunil Gavaskar. Sachin is the only cricketer to have been awarded the Bharat Ratna, India’s highest civilian award and the Padma Vibhushan, the second highest. Rahul Dravid was awarded the Padma Bhushan by the then-President of India, Pranab Mukherjee, in 2013, a year after he retired from international cricket. Dhoni received the ICC Player of the Year Award in 2008 and 2009, becoming the first player ever to win the award for two successive years. In 2011, the year he won the World Cup as captain, he was conferred the title of Lieutenant Colonel by the Indian Army, with Kapil Dev, the other Indian captain to win the World Cup, being the only other cricketer to be given the rare honour. Dhoni has been one of India’s most successful captains, having led them to victory in the 2007 World T20, the 2011 World Cup and the 2013 ICC Champions Trophy. He has 10,949 runs from 380 matches in ODIs and T20Is, and 4876 runs from 90 Test matches. He also became the first wicketkeeper to affect 100 ODI stumpings, during the series against Sri Lanka this month. As a captain, MS Dhoni led India to victories in three ICC Championships between 2007 to 2013.Under his captaincy, India also became the number one ranked Test Team for the first time in 2009. He led the team successfully to the World T20 (2007), the Champions Trophy (2013) and the World Cup (2011) titles. He is the only captain to achieve this feat. With 27 test victories, Dhoni is the most successful captain in the Indian cricketing history. His 183-run innings in 2005 against SL is the highest score by a wicket-keeper. Dhoni has led the national Indian Cricket team in 331 international matches and has hit 204 sixes, the most by any captain in the world. His score of 224 in Tests is the second-highest by an Indian captain. 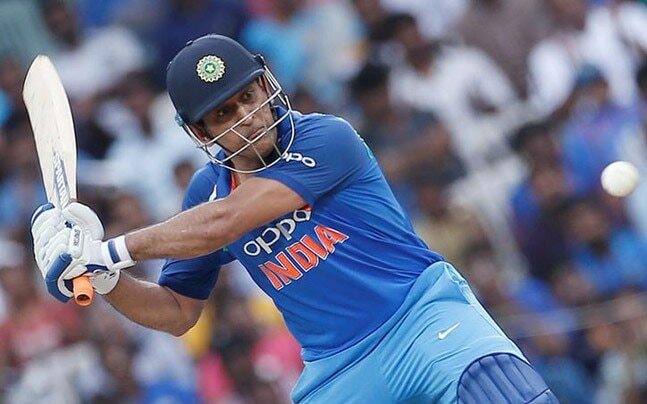 The Padma Bhushan, if awarded to Dhoni, will be a well-deserved recognition for the 36-year-old, who has recently been in a rich run of form with the bat, averaging close to 90 in ODIs in 2017.